Like Jesus I resurrected today with the help of Ibuprofen. Okay, Jesus didn't have Ibuprofen but thank His Heavenly Father, I did. I took it and within an hour felt well enough to go do the Holy Trinity/Trifecta of Costco, the library, Publix. It was pushing it, but I did fine. I bought what we needed, what we wanted, came home, unloaded everything, did some more laundry, started the crock pot with venison back strap, garden potatoes, carrots, onion, garlic. When I woke up, Mr. Moon was already home and I had my iced espresso and finished up the laundry and finished gathering the eggs. Seven today and I feel certain that none of my old hens are laying which is fine with us. They are now officially pets. Ms. Bob, Ms. Sharon, Ms. Ozzie, Ms. Trixie, Ms. Mabel. I probably rose from the dead because it's Friday and I didn't want to miss my Friday night martini on the porch. How sad is that? Hey. Whatever gets you through the night. I'm almost finished listening to Life, the Richards' autobiography, and the last few discs are read by "The maestro himself," as Johnny Depp said when his part was finished. I've listened to this audio book how many times? I don't know. 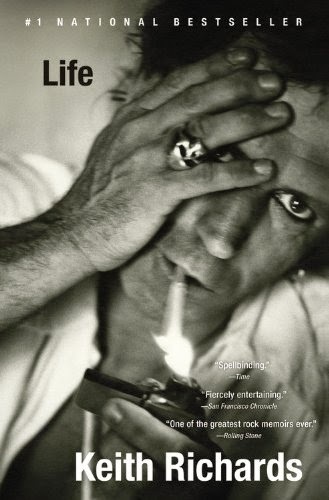 And each time, I am knocked out again by the honesty, the humbleness, the humor, the intelligence of Keith Richards. Mr. 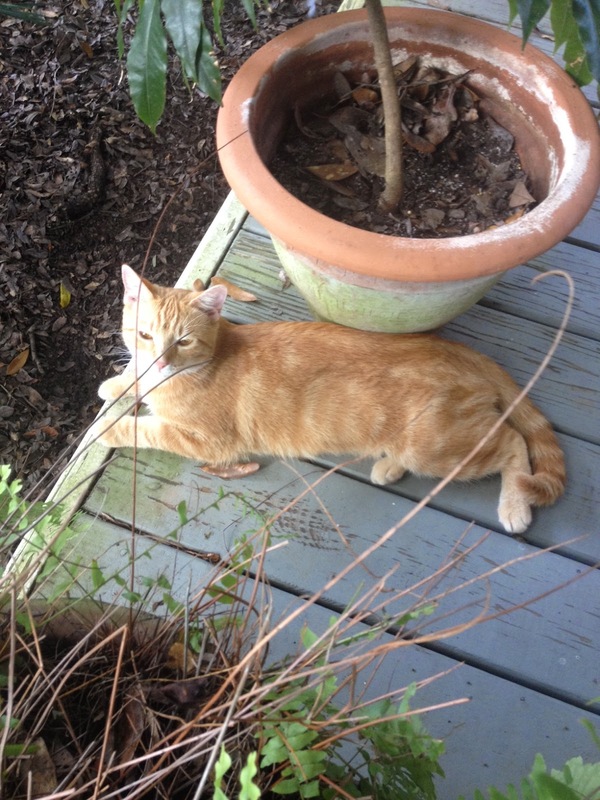 Moon and I sat out on the front porch and Maurice joined us. She is part of our Friday ritual now and follows me out there as if she knows what's going on. She never goes into the front yard unless it's Friday night and we're sitting right there. 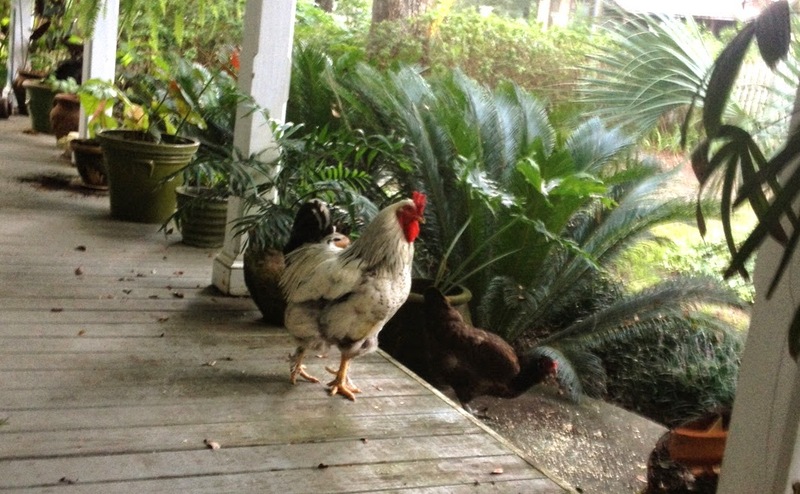 The chickens came up and I fed them leftover oat bran bread. Elvis is so magnificent. As is our porch, our yard, our life. We need rain and I feel as if when it falls I will be healed. Until then, I am doing well enough. I would like to take this opportunity to thank Celexa, Ibuprofen, the Great Mystery Which Is Cats, Kathleen who brought me my first chickens, and the sweet, good compassionate person whom I am married to. Gonna go make some banana muffins. Quote of the day from Keith Richards: "I am not an arsonist. I am a pyromaniac." Quote of the day from Ms. Moon: "Chickens are the best pets I ever had." I'm so glad that you're feeling better and that martinis were still had on the porch. Keith Richards has been on a couple with the old legends... thought of you and here your posts mentions him. Elizabeth- It was a lovely evening. Carolyn- That was freaking awesome! Thanks for the link. I think that I may be a pyromaniac too. We do love our burn piles here on the farm.